A gyroscope’s capacity to stabilise is its angular momentum. This is a measure of how big the rotor is and how fast the rotor is spinning. Gyro Marine offers gyroscopes from 150,000 Nms to 1,500,000 Nms. Gyro Marine offers gyroscopes with stabilising capacities from 300,000 Nm to 1,850,000 Nm. Gyro Marine gyroscopes can be located anywhere on the ship with equal effect. This includes offset from centreline or offset about center of gravity; vertically or longitudinally. Installation orientation is with control and electrical connection points oriented towards port and starboard and main accesses oriented forward and aft. This can be so oriented in either of two 180 degree yaw opposed positions. 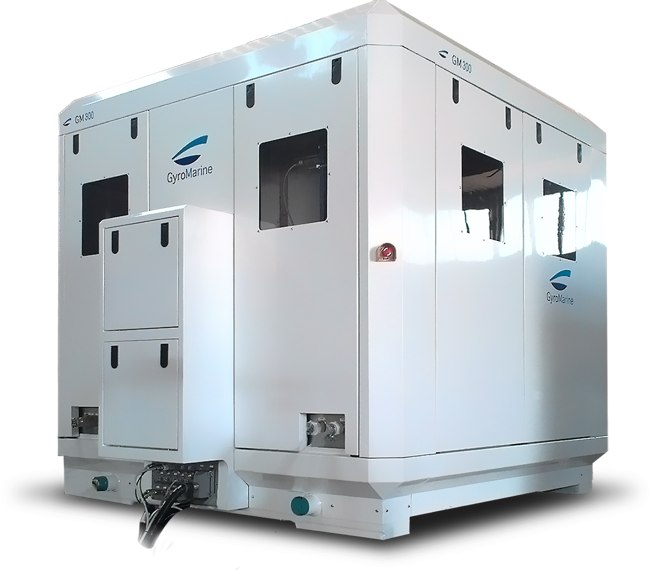 * The GM600 can also be configured in containerised form for temporary deck mounting. 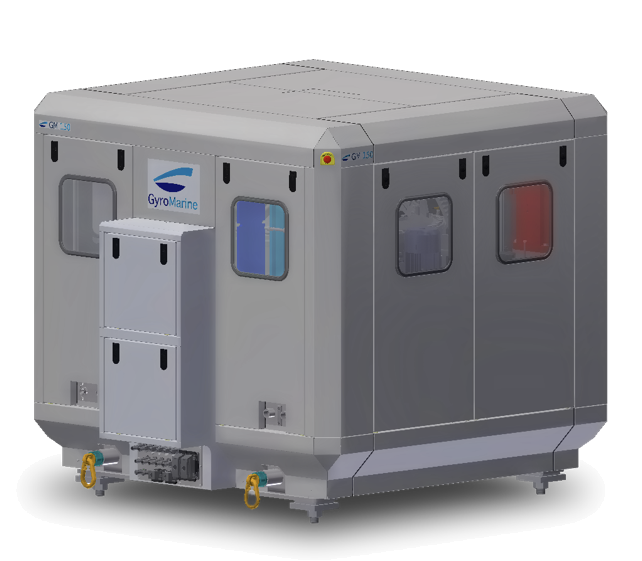 Larger capacity can be met with multiple units. Intermediate capacities can be met by derating a larger unit or with multiple units of different sizes. A single gyroscope of the appropriate size will always represent the lowest cost and the best weight and volume efficiency compared to multiple smaller gyroscopes. Multiple gyroscopes do, however, provide an additional level of redundancy. In built lift points on all major components. 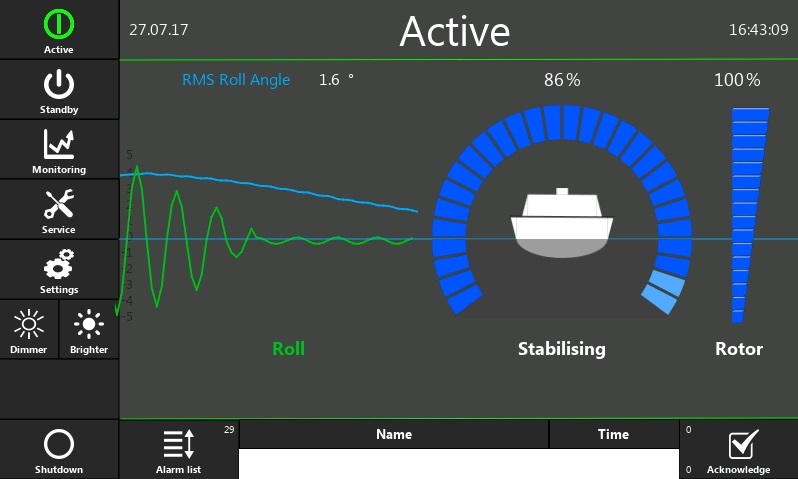 Full monitoring and display of ship motions including accelerations. Internal cross axis algorithms to ensure that gyroscope response is not negatively effected by cross axis motions. Averaging motions (RMS) displays to show motion trends over time. Monitoring and display of energy consumed by function including energy recovered. An all electric drive and brake with internal, fail safe, static brake. A high strength steel forging precision machined. Fully contained in structural housing with viewing port and internal illumination. Balanced to better than turbine standards for low vibration. Operating entirely inside a vacuum, with customised high speed vacuum seal technology, to reduce net power consumption. Direct controlled high efficiency, compact electric motor, with regenerative capacity. Titanium seawater cooler with start/ stop control and monitoring of remote supply pump. Internal water glycol cooling circuit for all device cooling. 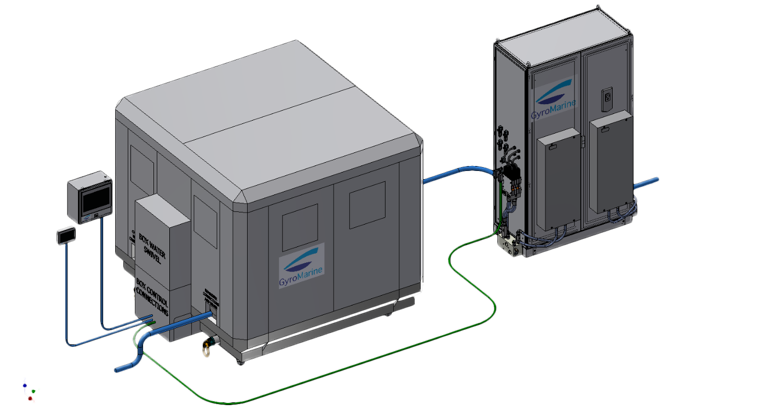 Flow and temperature monitoring on all cooled components including water cooled electrics. A sealed oil delivery, scavenge and conditioning system derived from aircraft technology capable of operation in any orientation. Filters that monitor clogging status and advise when approaching and in need of change. An active front end offering low voltage harmonics in advance compliance with future classification guidelines of THD <5%. 100 point self monitoring system with advanced warning of any critical condition. Cable break and sensor failure monitoring. Operating history and machine usage logs. Fully self contained module with single plane mount. Plugged or field terminable electrical and signal cabling. An ergonomic touch screen interface is available in both 12 inch and 6 inch format. Each has identical full featured control and monitoring. Multiple screens are typically used to provide full control from both bridge and local to the gyroscope. Local control should be sited within visual reference of the gyroscope for service. Service mode will be disabled on all other panels. Normal operation can be realised with single button press Active / Shutdown from any networked user interface.